Has your partner ever commented on you grinding your teeth overnight, or have you woken up with a sore mouth or a dull headache? If you’re left wondering ‘why do I grind my teeth in my sleep?’ then read on, because in this article we will be looking at nighttime teeth grinding, the reasons for it, and the ways in which it can be managed. It is quite normal for people to occasionally grind or clench their teeth, and this behavior doesn’t usually cause any problems. Some people find themselves doing it more often, particularly at night, and this can have some serious effects. It is known as bruxism, and in severe circumstances can result in headaches, a painful mouth, poor oral hygiene, and even blunt or lost teeth. Most people who grind at night don’t even realize they are doing so, with the only clues being that they wake up with some of the symptoms, or a partner tells them about it because of the sound that is caused. 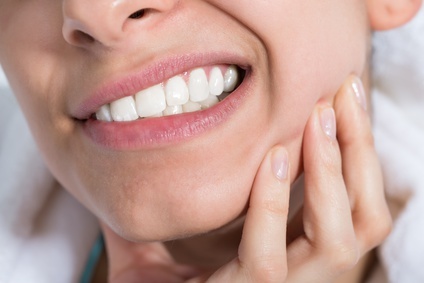 Bruxism isn’t a condition in its own right, as it usually occurs as a symptom of other factors. It is thought that about 70% of cases are a direct result of increased stress and anxiety levels. The remaining cases happen because of sleep conditions like Obstructive Sleep Apnea or lifestyle choices such as frequent alcohol or caffeine consumption, smoking, or the use of recreational drugs such as cocaine and ecstasy. Some prescription drugs have also been known to cause grinding, particularly antipsychotic and antidepressants that affect the serotonin levels. It is not thought to be triggered by things like the last meal before bed or eating too closely to the time you go to sleep. Who is Affected by Grinding in Their Sleep? Anyone whose lifestyle choices are mentioned in the previous section are at risk of exhibiting the behavior, but it is most common in adults between the ages of 25 and 44. It is thought to affect about a tenth of the population, although the severity wildly differs. Some people’s experience will be very mild, while others can find it to be more vigorous. If the grinding of your teeth in your sleep is becoming uncomfortable, or is very frequent, then you should visit your dentist to assess any damage that has been caused. They will also be able to give you a mouth guard to wear before you go to bed that will protect your teeth and jaw from any further problems. This will only protect you from the effects of teeth grinding, though, and won’t solve the problems that are causing it to happen in the first place. To actually solve it, you must first understand the root causes and then work out a way to deal with them. The main cause of grinding is stress and anxiety, and there are a number of ways to help reduce this. Counseling, exercises, physical therapy, and medication are all options, but you should consult with a doctor before pursuing these to ensure you are using a method that has a good chance of success in your situation. Similarly your doctor will be able to assist with any sleeping disorder that might be causing your grinding. If you take part in any of the activities that increase the chances of grinding, then stopping them will have a noticeable effect. This means reducing the amounts of alcohol, caffeine, and nicotine that enters your body within the hours before you go to bed, and if you take recreational drugs you should think about stopping that entirely. There are some behavioral changes and exercises you can try as well. Sometimes grinding can be more likely because your jaw is used to following that movement. By avoiding chewing actions that are not associated with food you can reduce your mouths propensity to follow that action. If you regularly chew gum or the lids of pens, this would be a good place to start. You can also train yourself to prevent the motions by being aware of your mouth during the day. If you notice that you are clenching or grinding, try stopping yourself and placing the tip of your tongue between your teeth. This will help to train your muscles to relax and hopefully reduce grinding. In a similar way you can also relax your jaw muscles at night by holding a warm cloth against it. Grinding your teeth at night can cause some painful effects and often goes unnoticed for a long time because you are fast asleep when it happens. It’s potentially damaging, though, so it should be treated as soon as you realize it is going on. There’s a variety of ways to protect your mouth from the effects and deal with the causes, so don’t be alarmed if you are wondering ‘why do I grind my teeth in my sleep?’. Seek advice from a doctor, and they will be able to offer a range of solutions. If you have any questions or comments, please leave them in the section below.